Why you’re wasting your time focusing on "target markets"
It’s important that you have a very specific target in mind for your marketing to be effective. Knowing whom you’re talking to is crucial when you’re writing your marketing material… this is Marketing and Copywriting 101! When writing your marketing copy, you need to be able to put yourself into your prospects’ shoes. That way, it will help you to speak your prospects’ language, and address their specific needs and problems. And the reason why business owners don’t have a clear picture of what their prospects look like is because traditional marketing books and courses drone on about “target markets”. They talk about mumbo jumbo such as “socioeconomic profiles” and “industrial segmentation” …Yawn! Invariably, business owners respond to this mumbo jumbo by devising really broad definitions of their “target market”. These “target market” definitions are simply too vague to be practical. Flooring supplier: any home or business within a 10km radius. Property manager: property investors in my catchment area. IT supplier: all SMEs (small and medium enterprises) in Wellington. These broad definitions may be well and good for the academics teaching about “target markets”, but you’ve got a business to run and sales to make. And these broad definitions are actually going to hold you back, because the resulting marketing messages are likely to be too vague to be useful. The problem with these vague definitions of a “target market” is that they lead to vague and uninspiring marketing messages. Flooring supplier: Do you have a home or business in Auckland? We can help you with all your flooring needs! Property manager: Let us help you with your property management, so you have more time to spend on things you enjoy! Manufacturer of high quality dog treats: Nutritious treats for your best friend! IT supplier: One-stop shop for your business computer needs! Those kinds of headlines are 100% snoozeworthy! They’re so general; they won’t grab anyone’s attention. So you need something less theoretical and less broad when targeting – and more “real” and specific. The reason why this concept of a target market doesn’t work is because it’s too vague. It’s so broad, that you won’t appeal to anyone. Instead, you need to get really really specific with whom you’re targeting. And the best place to start is with your existing customer base. Specifically, look at your top-notch, A-Grade customers. Spend a good amount of money with you – and are likely to do so again in the future. Pay their bills on time and without haggling over the price. Are a pleasure to deal with, because they’re people whose company you enjoy. They are respectful of you, and you are respectful of them. They may also be raving fans, and regularly send new customers your way. Flooring supplier: Alisha and Ben have just bought their first home, and it’s a “do-up” job. They put new flooring into every room, transforming a drab house into a chic home that’s ideal for entertaining their friends. So the flooring they’ve chosen is both fashionable and hardwearing and easy to clean, to suit their busy lifestyle. Alisha and Ben are about to buy a puppy, and are thinking of starting a family. Property manager: Rupert has just been promoted to Sales Manager of a large corporation, and has just bought his first investment property. He has a plan to accumulate a portfolio of investment properties over the next 5 years. He’s hungry to maximise his profits and have no tenant-related headaches. Rupert wants to delegate the property management, so he can focus on his day job and earning the bonuses that’ll let him purchase more properties. Manufacturer of high quality dog treats: Jane’s west highland white terrier, Lili, is her best friend. But like many dogs of her breed, Lili has skin disorders, which are triggered by certain foods. Jane wants to be able to give Lili treats, but the mainstream products make Lili sick. Jane’s discovered that Lili responds well to these dog treats, and has a standing order of treats automatically delivered each month. 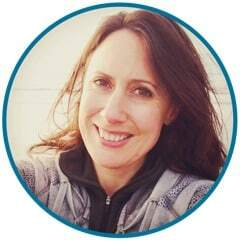 IT supplier: Siobhan’s just hired another bookkeeper for her growing accounting business. As her business is totally reliant on computers running smoothly all the time (plus data security is important), she’s invested in on-going remote monitoring of systems, premium anti-virus software, plus online data back-ups. The supplier also visits once a month to fix any computer bugs and niggles, and checks printer supply levels, re-stocking as needed, so that Siobhan can focus on running her business. Defining target profiles works for business selling products and services, as well as B2B (business-to-business) and B2C (business-to-consumer) companies. What do you do with the target profiles? 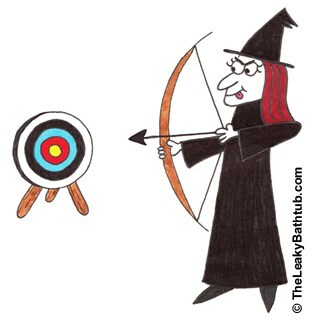 So you’ve identified your target profile – what happens next? Have your target profile in your mind when you’re writing your marketing and promotional copy. Think: does what you’re writing appeal to your target profile person? Flooring supplier: Renovating your first home? Budget-friendly, fashion-forward flooring that’s housewarming-proof, pet-proof and baby-proof. Flooring that’ll cope with whatever life (or your kids) throw at it. Property manager: New to property investment? We’ll grow your assets with property management services designed to make you richer. Manufacturer of high quality dog treats: Poorly pooch? Organic, nutritionally-balanced dog treats for a healthier pet. Formulated to address common doggy difficulties, from bad breath, to itchy skin, flatulence and more – or your money back. 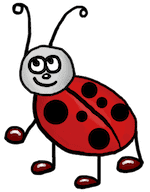 IT supplier: Never experience a computer bug again with our proactive, fixed-price maintenance services! Focus on growing your business – on computers that run faster than your competitors’. Note: This is the high-level, condensed copy… in most cases you’d have more space to expand on that message (e.g. on a web page, or in a brochure). The idea is for you to see how this copy is more specific (and more intriguing) than the generic target market-centric copy shown previously. Make sure you get (good) testimonials from your target profiles, and put them on your website and in your proposal documents. Remember, like attracts like. Have you ever had a new idea or concept for your business – but you didn’t know if it was lousy or genius? Ask your target profile for feedback. And no, they won’t be offended… chances are they’ll be flattered to be asked! Really! Sure, you don’t want to bug your target profile all the time about every tiny little thing, but asking them on important matters once or twice a year is absolutely fine (and a good way of keeping in contact with them, above and beyond your regular customer retention activities). There are external factors (political, economic, social, technological) that create change in your business environment. You can’t change these things; rather you need to continually adapt your approach to use this change to your advantage. By having a continuous dialogue with your target profile, you’ll be well prepared to make these changes in your business. How many target profiles should you have? When you look at your list of A-Grade customers, chances are you may have several names on the list. It’s good to have multiple people to approach for testimonials, feedback, and keeping your finger on the pulse. However, when it comes to writing marketing copy, you need to pick just one target profile person. Yes, just one. If you try and address multiple people in the one message, you’ll be back at square one, talking to the “target market” and trying to be all things to all people. Instead, you need to pick the one target profile that is the most representative of the type of customers you’d like to have more of. You know, the profitable, big-spending ones – who are also pleasant to deal with. Pick that person and write your marketing messages as if you were speaking to that individual directly. If it helps, pin up their name on a Post-It note on your computer to help you keep focused on that one person. Isn’t it too narrow an approach to focus on just one target profile person? Seriously, the sooner you move away from the “everyone is my target market” approach to being more specific, you’ll get better results in your marketing. Because you’ll be communicating at a meaningful level, your message will actually appeal to more people. Best of all, your message is most likely to resonate with future A-Grade customers. So not only should you be getting more enquiries and sales, but also they’ll be coming from the kind of people you want to be working with. I challenge you to try it! All my consulting clients that have embraced this haven’t looked back since, because it’s made a real difference in their business. It’s given them a sense of focus and direction that they were lacking – and made them feel more connected to their customers. So go and really get to know your target profile – you’re bound to develop deeper relationships with your best customers in the process! The traditional “target market” terminology is too broad to be of real use to small business owners. Look at your A-Grade customers, and analyse those instead. These are your “target profiles” – a one-person target market. Speak to your target profile in your marketing material. Obtain (and use) testimonials from your target profile people. Get feedback on business-critical decision from your target profile people before you take any further action. Keep in regular contact with your target profile people so you can keep your finger on the pulse of what’s happening in your market and industry. Getting your A-Grade customers involved in this way usually deepens your relationship with them – most people will be happy (and feel honoured) to help a business that they already love! 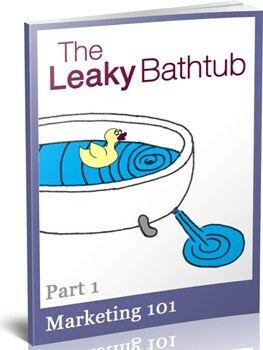 ‘The Leaky Bathtub’ eBook will guide you through defining your target profile step-by-step. Targeting is one of the chapters in my eBook, ‘The Leaky Bathtub – Part One: Marketing 101’. In it you’ll find even more examples, including a suit store, a workout gym, an accountant, a website development company, a hairdresser, and a fruit and vegetable shop. So you’ll see even more practical examples in action, to give you ideas on how to apply the target profile concept to your own business. There are also step-by-step exercises to help you develop your own target profile in 4 steps. The result: you’ll be far clearer on where to focus your marketing efforts!